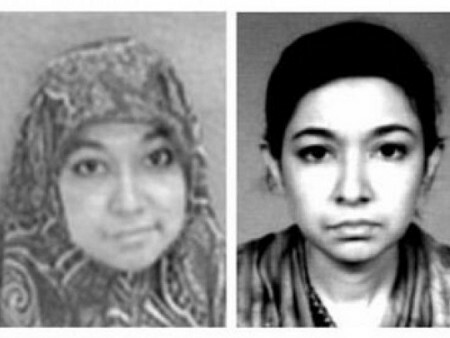 “Lady al Qaeda” Aafia Siddiqui, from her ‘wanted’ poster. Top al Qaeda ideologue Abu Yahya al Libi has released a new propaganda tape, entitled “Aafia Siddiqui…Captivity and Oppression, So Where Are the Heroes?” Al Libi calls on Muslims to wage jihad to avenge Aafia Siddiqui, who was sentenced in September to 86 years in prison for attempting to shoot American officials in Afghanistan. In his new tape, al Libi claims that Muslim women are being imprisoned and tortured throughout the world and that it is the duty of Muslims everywhere to avenge them. Al Libi argues that merely protesting on Siddiqui’s behalf, as many in Pakistan and elsewhere have done, is not enough. “America that has kidnapped your Muslim sister and her two sons is not far away from you, nor are there seas nor land nor boundaries nor barriers that inhibit you from reaching it,” al Libi says, according to a translation obtained by The Long War Journal. Al Libi continues by saying that America’s “bases and soldiers are within reach” and “its convoys even traverse your lands in plain daylight, carrying death and destruction to your brothers in Afghanistan.” America’s “intelligence centers and prisons,” “airplanes that harvest Muslims in tribal regions,” and ships are all within reach, al Libi says. “Kill them wherever you find them,” al Libi commands. Al Libi highlights and embellishes upon one of the most enduring myths concerning Siddiqui: that she was secretly imprisoned and tortured at the American-run detention facility in Bagram for years. She has been called the “Grey Lady of Bagram” by her supporters, alluding to her alleged time there. There is no evidence to back up this claim, yet it is widely believed in Pakistan and elsewhere. According to a recently leaked State Department cable made available on the Guardian’s (UK) website, Bagram officials have denied ever holding Siddiqui. The Bagram myth is used by al Qaeda, and even the broader public in Pakistan, to explain Siddiqui’s supposedly “missing” years between 2003 and 2008. In March 2003, after KSM named her as one of his accomplices during interrogations by CIA officials, the FBI issued a “Seeking Information Alert” for Siddiqui. The FBI added Siddiqui to its most wanted list in May 2004. In addition to the aforementioned officials at Bagram, US authorities have repeatedly denied that she was ever held prior to 2008. She was most likely on the lam until she was captured in July of that year. Still, the fiction that Siddiqui and her children were kidnapped by American officials has endured. State Department cables released by Wikileaks reveal that Pakistani government officials have repeatedly, and persistently, lobbied the US government to transfer Siddiqui. The cables reveal, however, that such lobbying was likely carried out to assuage popular discontent with Siddiqui’s imprisonment. The same cables note that the Pakistani public’s support for Siddiqui is based on widespread misinformation. Another cable, dated Feb. 12, 2010, notes the strong negative reaction to the guilty verdict handed down in Siddiqui’s case. The State Department noted that the Afghan Taliban had threatened to kill a US soldier they had kidnapped if Siddiqui wasn’t released. In addition, “Jamaat-e-Islam (JI) women activists demonstrated outside the party’s headquarters in Mansoora.” According to the US embassy’s analysis, widespread criticism of the US as “anti-Muslim,” as well as criticism of the Pakistani government for supposedly not doing enough to secure Siddiqui’s release, was being fanned by the Pakistani press. “Many Pakistanis were undoubtedly taken by surprise by the verdict as one-sided media coverage of the case reported only her defense and not the prosecution’s case, leading local observers to conclude her acquital [sic] was a near certainty,” the cable reads. By focusing on Aafia Siddiqui’s case, al Qaeda is clearly trying to tap into deep anti-American sentiment, as well as widespread discontent with the Pakistani government. Aafia Siddiqui has become the subject of popular mythology. In the Pakistani public’s imagination she is not an al Qaeda operative who evaded American authorities for years, but instead a victim of the American-led “war on terror.” The Pakistani government has attempted to placate this resentment by lobbying for Siddiqui’s release, but has failed. Al Qaeda knows this and is attempting to win more support for its jihadist agenda by highlighting the ineffectiveness of the Pakistani government’s attempts to secure Siddiqui’s release. Al Qaeda also seeks to play on the widely held misconception in Pakistan that the US is “anti-Muslim” for imprisoning Siddiqui. Curious how AQ or Pakistanis don’t care about all the Muslim women who were beheaded, stoned to death, raped. flogged, and/or mutilated by Muslim men. But Siddiqui, who is clearly enough of a valuable asset to AQ for them to even care, becomes the “daughter of the nation”; which ironically, given how far Pakistan has progressed into becoming a terrorist nation, makes perfect sense. If the Pakistani public have a skewed view of the case against Siddiqui, it is entirely the fault of the Pakistani military who tightly control the Urdu press there. They will have no incentive to change their behavior so long as we continue to wring our hands and excuse them for being duplicitous. What is needed is a measure of punishment to be inflicted on the military rulers to induce them to heel! Target their ill-gotten assets around the world, or the military-industrial complex that they control, or their spawn who, in most cases, live comfortably in the west. Mr. Joscelyn, there was indeed a woman detainee at Bagram, however it was not Lady AQ. Read the recently released book Operation Dark Heart and LTC Schaffer talks about the woman, who she was, and why she was detained. Charu, there is nothing curious about it at all. All well-organized and disciplined modern armed movements and states are aware of the importance of propaganda and pick and choose what to highlight and what to suppress. They also manufacture stories where nothing is available ..the US e.g. did this when they invented stories about babies torn from respirators in Kuwait, Pakistan and India do it all the time, propaganda is propaganda…why would that be a surprise to you? The modern Jihadist project is a serious enterprise, with intelligent people manipulating morons for their purposes. They also have a long time horizon and are willing to be patient. Unfortunately, I dont think this is going to end well. It would be better for the ordinary people of India, Pakistan and Afghanistan if one side was decisively superior and knew what it was doing and won a quick and complete victory. But that is not the case. The Jihadists worldview is ultimately incoherent and even suicidal. They cannot win, but the US cannot seem to win either. A US withdrawal will not be a jihadist victory but it will embolden them to get into more spectacular trouble and the bottom line will be terrible suffering for the area’s population. Based on that, I had hoped that the US would succeed in imposing some sort of semi-enlightened Pax Americana and let the people of the region get to work building real economies and solving real problems. But that does not look likely. The alternative looks even worse. Its a very depressing scenario.. I think you need to go timeline Aafia Siddiqui’s *on the judicial record* information regarding her meeting and supposed exchange of gunshots with the US. At the time Bagram was denying it had ever held Siddiqui, it had her bullet embedded body in its corridors, awaiting shipment to the US. Of course 86 years in prison is good with me, as long as it stays that way. Omar, those are interesting positions you have there. I believe the mistake made in that region by US was not when we got on the road to Kabul, it was when we got on the road to Baghdad. Over time though, I seriously believe that the mistake can be corrected. This struggle (or war) has to “evolve” (so to speak). The way I feel about it, is that even if it takes a thousand years, then so be it. And, contrary to the opinion(s) of the “cut & run” crowd critics, we certainly do have the resources to pursue this thing for the next thousand years. As far as Pakistan is concerned, I am absolutely convinced that if push came to shove, Pakistan would be the first to blink (especially if it involved US in a partnership with India). Oh the post that got wiped before my second one was merely that she should be killed (I expressed it in a slightly gory fashion). The propaganda is not directed at Pakistani’s, it is directed at us.